WASHINGTON, DC – Last Wednesday, the House of Representatives passed an amendment by Congressman Thomas Massie to block the Bureau of Alcohol, Tobacco, Firearms, and Explosives (BATFE) from banning common rifle ammunition. The amendment, which was part of the Commerce, Justice, Science (CJS) appropriations bill, passed 250-170. Massie's amendment was one of a trio of amendments last week that took aim at recent ammunition bans. 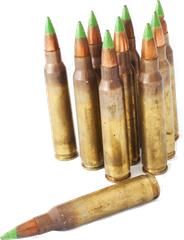 Congressman Richard Hudson (R-NC) introduced an amendment that would prevent any M855 or SS109 (.223 caliber / 5.56mm x 45mm) type rifle ammunition from being treated as "armor piercing" ammunition. This comes after the BATFE backed off a controversial proposal in March to restrict the popular M855/SS109 ammunition. Congressman Paul Gosar (R-AZ) introduced an amendment that would overturn a 2014 administrative ban on 7N6 type (5.45mm x 39mm) ammunition. Both the Hudson amendment and the Gosar amendment passed by voice vote. The Massie amendment addresses both the 7N6 ban and the proposed M855 ban, by clarifying that ammunition can not be retroactively treated as "armor piercing" simply because a handgun is later designed that can shoot the rifle ammunition. It states, "None of the funds made available by this Act may be used to treat ammunition as armor piercing for purposes of chapter 44 of title 18, United States Code, except for ammunition designed and intended for use in a handgun (in accordance with 18 U.S.C. section 921(a)(17))." The House passed H.R. 2578, the underlying CJS appropriations bill, 242-183. All three amendments will require passage in the Senate before advancing to the President.